Over the internet, one can easily find a lot of references for uploading images to a database. The major problem arises when one has to retrieve these images and display them in some server control, like the GridView control. In this article we will tackle exactly that. So let's begin... shall we? This tutorial assumes that you own a copy of Visual Studio 2005 or Visual Web Developer Express. It also assumes that you are familiar with ASP.Net 2.0 basics and have worked with SQL Express before. The Text-Box followed by the Browse button is the HTML File Input control. After adding this control onto the form switch to Source-View and add modify the control's source to include runat="server". This will allow us to use the control as a server control. fileUpload - To select the file to upload. txtTitle - The title of the image. btnUpload - On click uploads the selected image. lnkView - The View Images link that loads the images from the databases inside a GridView. Validation Controls - The Required Field Validation Controls in order to make sure that Title and File are selected. Switch to the code-behind class of Default.aspx and add a button click event handler for btnUpload. lblStatus.Text = "No file specified." lblStatus.Text = "Only gif, bmp, or jpg format files supported." lblStatus.Text = "Image uploaded successfully." lblStatus.Text = "An error occured while uploading Image... Please try again." What this function does is that it grabs the file selected in the File Input control and gets its extension. If the file is of type jpg, bmp, or gif, then it proceeds otherwise it throws an error. This terminates upload if the selected file is not an image of supported format. After checking the file format, we get the length of the file and create a Byte Array of that same length. This Byte Array will store our file/image for us. Using the InputStream.Read method of fileUpload control, we load the image into the Byte Array. After having saved the file into the byte array, we call our function Doc2SQLServer to store the file. We pass in the title that was supplied by the user, the byte array (which is our image), the total length, and the type of image. In the Doc2SQLServer method, we create a connection to our SQL Express database and create an insertion command. After connecting to the database, we execute the query and store our image and its information to the database. Below is the Doc2SQLServer method. strSQL = "Insert Into tblImage(imgData,imgTitle,imgType,imgLength) Values(@content,@title,@type,@length)"
Dim connString As String = "Data Source=.\SQLEXPRESS;AttachDbFilename=""|DataDirectory|\imgDB.mdf"";Integrated Security=True;User Instance=True"
Next we create a web-page that will grab the image whose id is passed to it as a query string. Right-click the project in solution explorer and add a web-page imgGrab.aspx. What this does is quite simple. It gets the image data whose id is passed in and writes it to the web-page. Response.ContentType sets the web-page as an image content holder and when we write the complete byte array to the response stream, we actually get the image. A major problem faced by developers is when loading images back into the datagrid or the new gridview control. I myself faced long hours trying to come up with a solution for this, which in the end was a simple procedure. Create a new-page, Viewer.aspx and add a GridView onto it. (This page is linked from the Default.aspx page via lnkView). Name the GridView imgGrid and click on the small box located at the upper-right corner of the control. Click on Edit Columns to open the Fields Dialog as shown below. 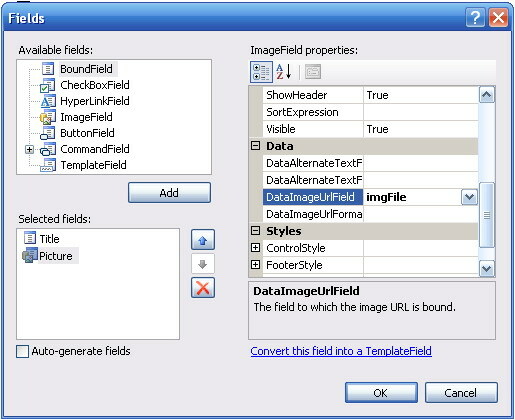 In this dialog, uncheck "Auto-generate fields" and add two fields; a bound field and an image field. For the bound field set the column header text to Title and the DataField property to imgTitle (This will bind this column to the imgTitle column in the dataset to which we will load our table data). As for the image field, set the caption to Picture and the DataImageUrlField to imgFile. You might think where this imgFile comes from, especially since the database does not contain a column with such a name. strSQL = "Select imgId,imgTitle from tblImage"
What this function does is the simple task of grabbing data from the database. It grabs two columns, imgId and imgTitle. What it does afterwards is the key concept... and the few-lines of code that marks the solution to a big problem. After filling in the dataset, we know that it contains one table, at index 0 of course. We add a custom column "imgFile" to it. After that, we traverse through each dataRow in the table. And for each row, we make a call to our imgGrab.aspx page with the id from that row. We set this equal to the record for imgFile for that row. Thus on display of the GridView, for each row being displayed, the imgGrab.aspx web-page is called and the image is displayed in return. The possible problem could be if your visitors try to upload large image file. Page will look blank until image is loaded, so visitor could think that something is wrong with application and leave or click refresh button (refresh will cause restarting of upload). There is freeware WaitLoading control as a part of AspLib component library. It can be customized so your user will have a message that everything is ok and operation needs time to complete. The part of the library is also specialized datagrid with its image column. This column type works with images stored in database and support image edit, upload and delete. The main emphasis in this article was on uploading images to a SQL Express database and then displaying those images in the GridView control. I know there are a lot of different articles explaining the technique for uploading to the database, but none for explaining a simple method to retrieve them to a GridView or similar control. Please download the code for this article and play around with it to learn more about it. I hope you found this article interesting and informative. I am open for suggestions and remarks, both negative and positive. Feel free to contact me at salman@premierpos.com.